On a bourgeoning stretch of Venture Boulevard, The Great Greek has become a Valley staple, a place where families come to feast on freshly-made tabouli, stuffed grape leaves, spanakopita and Mediterranean pastas. 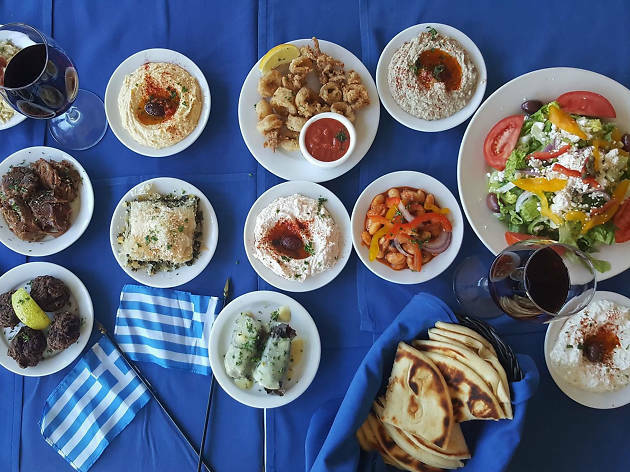 There's also a large selection of large plates—moussaka, chicken kebabs and swordfish Santorini, all served with oven-roasted potatoes, Greek pilaf and vegetables. A family-style feast is offered for $30 per person, and live entertainment is provided to put diners in a festive mood. A friend suggested The Great Greek as a spot for a group of us to have a get together and be able to talk while enjoying good food and live entertainment (from the dancing servers!). The service was very friendly and we shared a variety of items from the menu. Each item had a very distinct flavor and stood out on its own. The Avgolemono Soup, a lemony chicken soup with egg and orzo pasta stood out as did the Dolmathes - grape leaves stuffed with beef and rice. While it was a bit salty for us, the Cognac flaming 'Saganaki' cheese offers that gooey, caramelized comfort feeling along with their fresh baked bread. 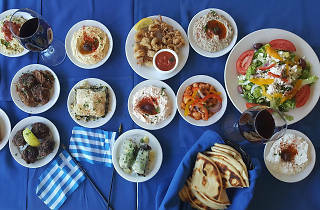 Finally one cannot go wrong with their Greek-Style vegetarian platter, including yogurt tzatziki, hummus, eggplant, tabouli, spinach cheese pie, rice pilaf, fassolia beans, feta cheese, fresh salads and more. They have a great choice of wines, beer and cocktails to wash it all down.